The sizes are slightly bigger than other's. Easy to insert printed badges, not damage the paper. The Plastic Single Layer Thickness is 0.4mm, thicker 60% than Standard 0.25mm. All New poly vinyl chloride material,No Recycling Plastic Scrap. They are flat and good looking, not like other's flimsy and warp(bend/tangled up /wavy). Match your clothes. In summer we use a little harder plastic material, so they are not stick and warp in the hot. In winter we use more flexible PVC material, so they are not brittle and break easily in the cold. The Resealable Zip are very good, waterproof sealing treatment, easy to open and close. Crystal clear transparent on both sides. The cards with barcodes or QR codes can be scanned without removing it from the badge sleeve holder. CHECK OUT ALL THE BADGE PRODUCTS! Just Right Length and Width. I'd Sleeve/pouch/cover protector Outer Dimensions: 4.6" L x 2.81" W , Inner Dimensions: 3.54" L x 2.6" W. Compatible with Avery Name Badge Inserts 5390 / 05390, 2.25 x 3.5 Inches, comfortably fits 1-5 pcs of credit card or driver's license sized cards. Durable PVC (poly vinyl chloride) material, wear-resistant and corrosion-resistant properties. Single layer thickness is increased to 0.4mm, with an increase of 60% compared to the standard thickness 0.25mm in Amazon. High transparency. Even if multiple badge holders overlapping, read effortlessly. 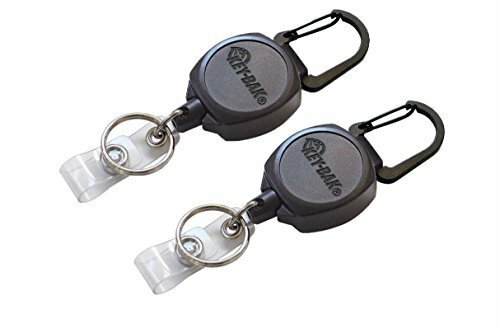 Dual-use hanging slot/holes design, the middle slot for lanyard, keychain or retractable carabiner reel clip, the both side holes for the cord/strap/string/thread. Strong and Flexible plastic material. The badge holders will not leave trace, folded and refolded many time. The hanging Slot/holes will not break, distorted many time. Wider Edge, not cracking. Hot pressing forming production line at a time. Fully automated operation, close bonding pressure to improve the bonding more firm. Long-term use will not be aging. Low temperature resistance. After testing at -30 Degrees Celsius, it will not embrittle, to avoid cracking. 100% Money-Back Guarantee. The manufacturing process does not add any toxic and harmful plasticizers and stabilizers, with non-toxic, no smell, no heavy metal pollution, to ensure safety and environmental protection. Carabineer clip makes it easy to secure to belt loops, backpack, purse and more. Package included : 5 retractable badge reels. Individually wrapped. 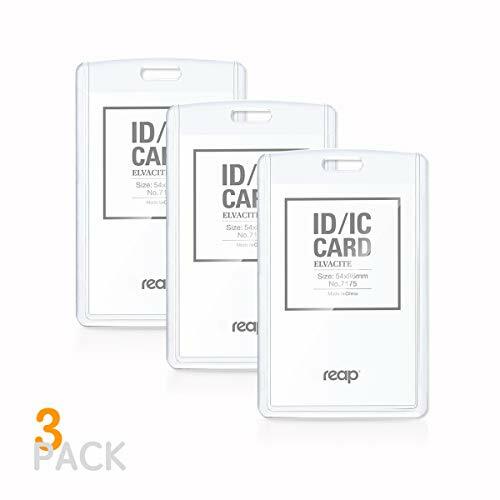 Why Waste Your Time to Buy ID Card Holder and Neck Lanyard & Badge Reel Separately?Buy This ID Card Holder with Lanyard Set You Will Get All!!! 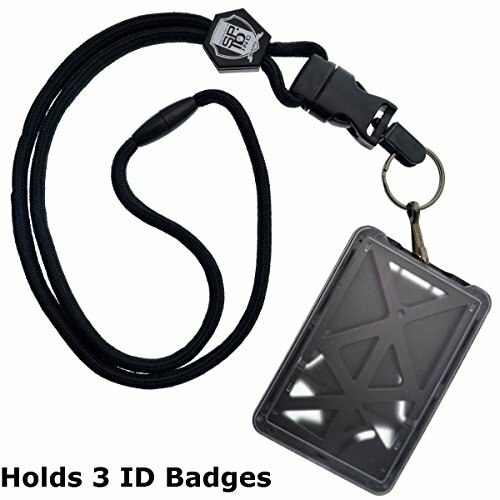 Key Features *ID Lanyard,Badge Holder and ID Badge Protector 3 in 1 set. *The clear zipper top keeps out dirt and moisture to help protect your employee identification safe and secure. *Slip your regular sized ID inside from the top and seal the zip top to protect your badges. *Pre-punched slot well design for Badge Reels,Lanyards and Metal Clips' Hanging. *Soft Braid Polyester Lanyard makes comfort wearing. *Plus Neck Lanyard and Retractable Badge Holder Extension Cord,scan your ID cards becomes so easy. 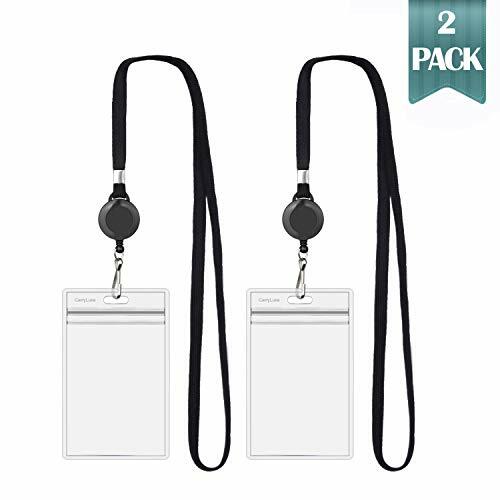 Package Includes 2 x Vinyl ID Badge Card Holder with Lanyard and ID Badge Reel Product Details - Lanyard Length:17.75"(45cm) - Badge Holder Cord Length:23.6"(60cm) - ID Badge maximum insert size:H 3.75"xW 2.75" (94*70mm) - ID Badge vinyl thickness: 0.3mm*2 sides - ID Badge color: Translucent - Shipping Weight: 1.66 oz. Customer Satisfaction Warranty We're sure you will love our product, we will replace it if needed or give you a hassle free refund. Thanks to our dear customers' product reviews, we upgrade the flower petals, so the badge reels you get now are much more durable and beautiful. 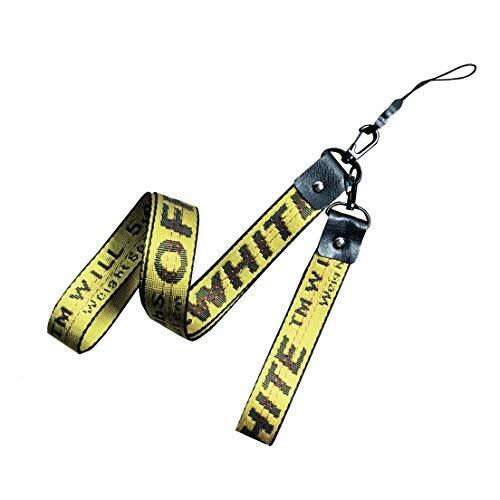 Our team focus on providing preferential and durable Badge reel products. We hope our badge reel will make your working days more colorful and interesting, a little change, even a badge reel, can make a big difference. The durable stainless steel Alligator clip can hold your clothes tightly so that no need to worry about your badges will fall off. What's more, the 360-degree swivel Alligator Clip will make it easy and convenient to wear from any angle and make your badge straight Up at the same time. 3 Pack - Pink, White, Black. With the durable nylon wire and Automatic stretching Clockwork, our baddge reel's Max retractable length can be 24 inches, which could meet the most daily use. Contact us if you have any problems any time, our team keeps on providing good customer experience. 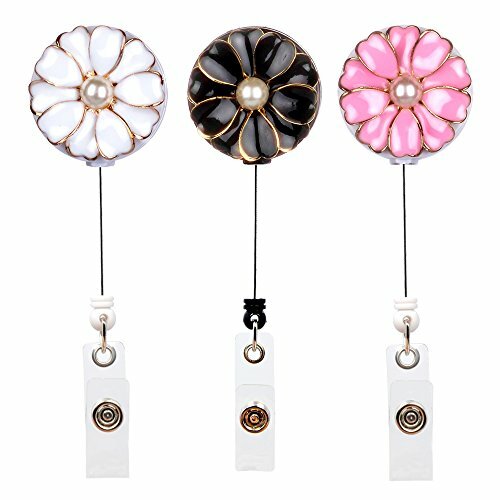 UPGRADE Petals: Thanks to our dear customers' product reviews, we upgrade the flower petals, so the badge reels you get now are much more durable and beautiful. 360 Degree Swivel Alligator Clip, Max 24 inch Retractable length, 3 pack in total. Unique Design: The flower is 1.26 in across, the pod is 0.4 in thick - Suitable for nurse, teacher, student, volunteer, perfect decoration for ID badges. What You Get: Our worry-free 12-month warranty and friendly 7X24hrs customer service. Retractable Reel Line extends to: 65cm / 26.5"
Great for your key, reels, badges, name tags, ID card, lanyards, eyeglasses and other little things. If you have any questions regarding our products or services, please feel free to drop us an email anytime, we will help you to solve anything on your problem and quick reply to you within 12 hours. [Widely use] Perfect for nurses, RNs, office staff, management, students, factory workers, employees, contractors and etc. [100% MONEY BACK GUARANTEE & LIFETIME WARRANTY ] You have nothing to loss, Give us a try and you will be very happy and satisfied. Witz waterproof ID and Badge Holders are perfect for carrying drivers Licenses, TWIC cards, photo IDs, credit cards or any other forms of ID. These cases are made of crush resistant ABS plastic and have rubber O-rings to keep out the water and dust. These cases come with a neck lanyard and Carabiner. 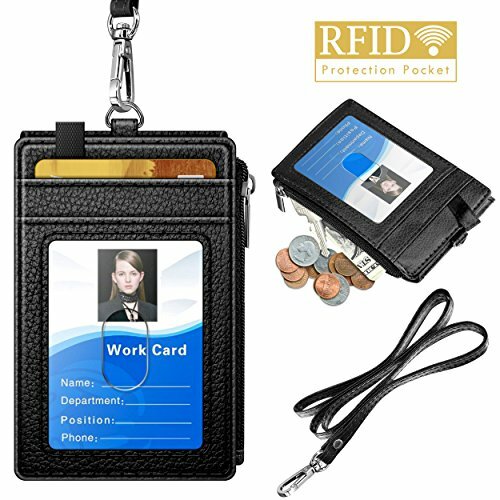 ELV ID Badge Holder Case PU Leather Credit Card Slim Wallet Neck Lanyard No more distraction and upset feeling by searching tickets, Small Change ID cards with no results in several bags just before checking in at airport, offices, school, hotel, Business Trips etc. With our multipurpose ID holder with mutiple side slots and RFID zipper Pocket, none of the above will happen again! 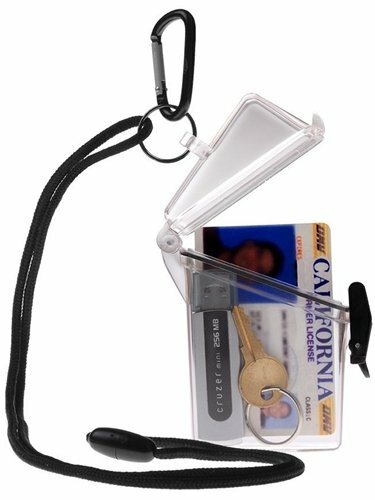 1 Clear ID window + 1 open card slot with PULL TAB (Front) + 3 covered card slots ( back) + 1 RFID BLOCKED cash slot with zipper pocket (side) + 1 20" detachable Neck Lanyard. How to combine BADGE HOLDER with ID WALLET? The secret is detachable neck lanyard and a multipurpose side slot! PACKAGE CONTENT: 1 x ID Holder. 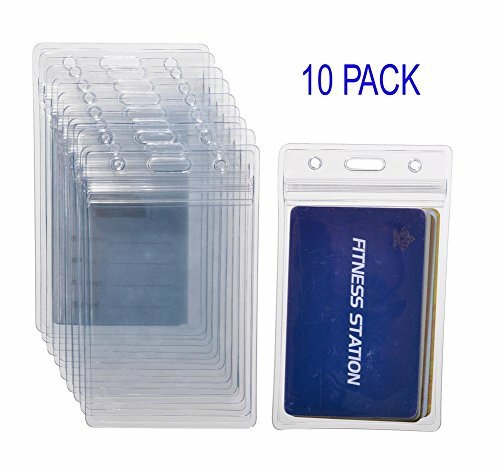 BADGE HOLDER STRUCTURE: 1 Clear ID window + 1 open card slot with PULL TAB (Front) + 3 covered card slots ( back) + 1 RFID BLOCKED cash slot with zipper pocket (side). ID window with clear cover features visibility and protection, makes it easy to scan ID Cards. Front anf Back Card Slots for easy management and access. ID's, event or location passes, name cards or business cards , cash, keys - all of these could fit into this specially designed PU LEATHER badge holder. MATERIAL: ID holder and lanyard are made by PU leather, and combine with top grade hardware with safety side zipper and back closer. No need to worry about cards could accidentally slip out or lanyard rips any more. 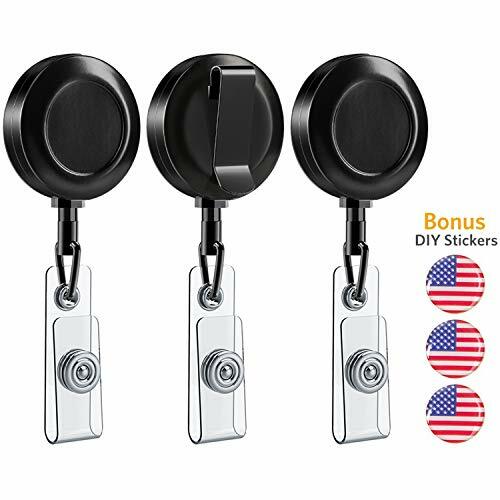 INNOVATION DESIGN: Great Badge Holder for those need multiple badges, cards, tickets and money (Offices, Airports, Government Employees and More), suitable for ID badges, School ID, drivers license, laundry card, debit cards, etc. This badge holder with large capacity. Whether dashing between classes or stepping out for an alfresco "meeting," keep your id close at hand with kate spade new york's badge holder and show off your glittering personality even on the run. 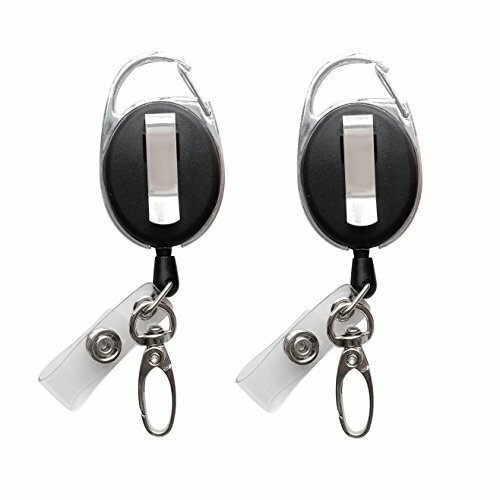 This ID badge holder can be added to you set of keys as a key fob, can secure onto luggage as a luggage tag, or even hooked on a lanyard as a stylish badge. Our new BadgeGuru set is unlike anything else on the market today! 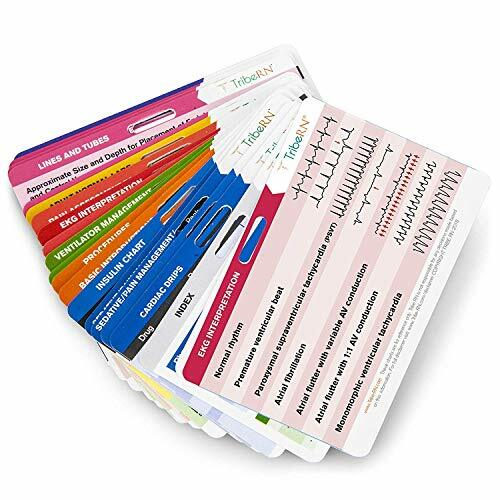 With 52 designs on 26 cards, these little mighty mites are so densely packed with vital information, they make the perfect companion for any medical professional.  NO TINY PRINT, NO WASTED SPACE: This 26 card set is packed full of vital information. Color-coded sections include General Med, Labs, OB L&D, Peds, Pharmacy, Respiratory, and Spanish Translation. DON'T GET CAUGHT OFF GUARD DURING YOUR CLINICAL ROUNDS: These are the perfect tool when you need a little cheat sheet on the spot. Don't have enough room on your badge for everything? These extremely durable cards fit perfectly in your pocket too!  NOT JUST FOR NURSES: These amazing little resources are perfect for EMTs and Paramedics too! Makes a great holiday, birthday or graduation gift! LIFETIME GUARANTEE: Just like all Tribe RN products, these cards come with our no questions asked lifetime guarantee. Standard badge-sized card size (3 x 2 ). Printed on a custom made, super durable waterproof PVC material card. 朗 BUT WAIT, THERE'S MORE :) BONUS CHEAT SHEETS! You'll receive a FREE membership to our VIP area! Access downloadable nursing cheat sheets, perfect to keep on your phone or print out for your next shift or clinical rounds! Sheets include two General Med sheets, Labs, Medical Spanish, Newborn, NICU, OB L&D, Pediatrics, Pharmacy, and Respiratory references. 3 unique Bandage nurse badge reels with a swivel alligator clip that rotates in a full circle. No more tangled up cords! We know you will love our badge reels. But in the unlikely case it does not meet your needs, we are happy to offer a full refund. IDEAL FIT: These cute badge reels are excellent nurse accessories. They are noticeable and people like to compliment it. PERFECT SIZE: Approx. 3 X 1 will get noticed. With a retractable badge holder of 24 inches. 100% GUARANTEE: We know you will love our nursing badge holder. Didn't meet your needs? We are happy to offer a full refund. SUITABLE FOR ANY AGE AND GENDER - unisex, anyone can use these: adults, teenagers, kids.. Attach this adorable Disney Mickey Mouse and Friends Lanyard to your set of keys, badge, or ID to keep them handy! The black lanyard features your favorite Disney characters including Mickey Mouse, Minnie Mouse, Goofy, Donald Duck, Pluto, Daisy Duck, and more! Includes a clear pouch to store your work badge, ID, or your Disneyland pass! Features a metal spring hook and quick release clip. 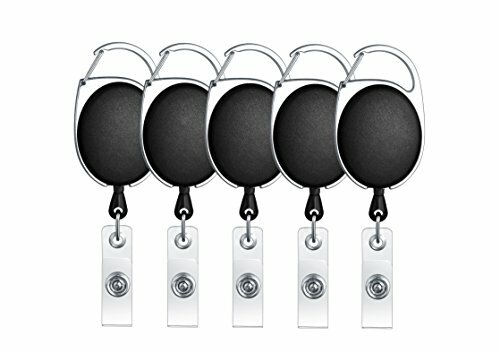 BUILD TO LAST: All metal zinc alloy construction with steel wire cord makes the most durable retractable badge holder, tested under more than 100,000 pulls. 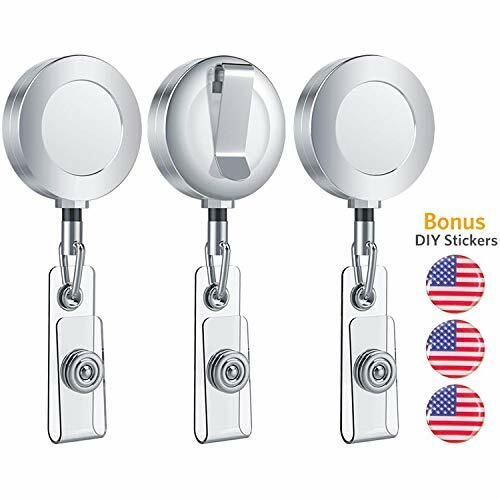 Package includes 2pcs retractable id badge holder with reel clip and ID strap, last forever. [Will Well Direct] is the only authorized seller of this product, please don't choose other sellers on this page. They will send fake and shoddy products. HEAVY DUTY: Max loading weight is 120g/4.5oz or 8 keys compares to 85g/3oz or 4 keys of other items on the market. Comes with key ring and perfect as retractable key chain. NON-BREAKABLE CORD: 27.5 steel wire cord that is much stronger and longer than normally 24 inch Nylon pull cord of other items. 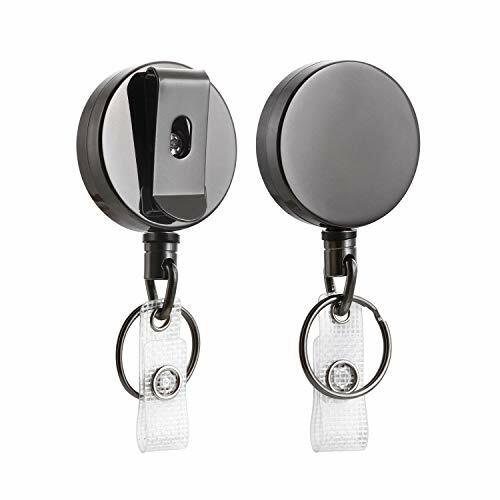 Unlock doors and access office is a breeze with this retractable badge reel. SOLID REEL CLIP: The clip is screw-fastened in the back side so no need to worry that it will fall off. Easily clip on to belts, pockets, purse straps, backpacks or anywhere you like. Perfect name card badge holder for any industry, men and women. Great for nurses, maintenance, medical and office staff, airport FAA and TSA, security staff, police, military, government, teachers, students, custodians, factory workers, employees, outdoor enthusiast and etc. 100% SATISFACTION GUARANTEED: Back with Will Well's 90 days NO QUESTION ASKED money back guaranteed and 24 months warranty. Please don't hesitate to contact us if at any time you aren't completely happy with the badge lanyard. For nurses, calming down patients and their families is a very important part of their job. 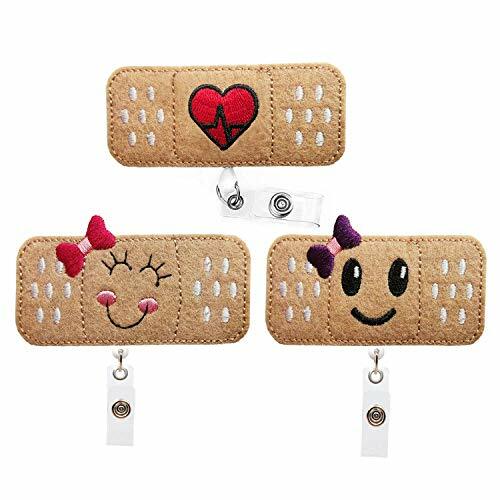 That is why we have designed a super cute and cheerful bandaid badge reel holder that will make anyone s day brighter and will help control their feelings. Because it s cute and easy to use. The felt ID holder is retractable, so it allows you to use your badge without taking it off. The alligator clip on the badge is resistant but will not damage your clothes, so you can wear it safely on your regular clothes or scrub s pocket. The amazing bandaid ID holder is a great way to make people smile and will help you carry your badge easier It has a very practical retractable system that allows you to use your badge without taking it off The cute bandaid has a smiley face with a cute bow that will make everyone smile The alligator clip on the back is resistant, but will not damage your clothes The badge reel holder is great for nurses, students or teachers to use It is made of a very durable and soft felt material, with a plastic reel and metal clip Size: 3 x 1.5 ADD TO CART NOW and make your job easier with the amazing bandaid badge reel holder! WHAT YOU NEED: Are you searching for a simple way to make a more cheerful introduction and transmit friendliness to strangers? 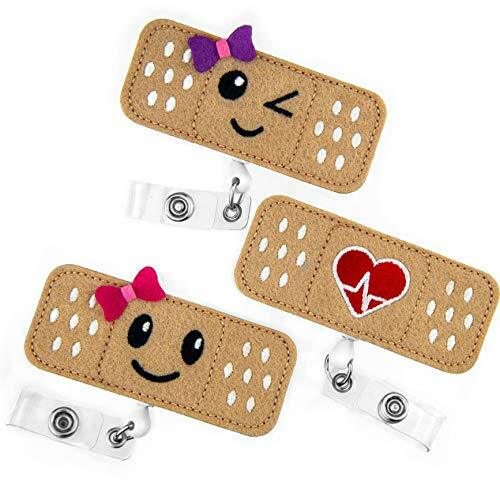 We have the answer with the amazing bandaid smiley face badge reel holder! VERY PRACTICAL: Our ID badge holder has a simple mechanism with an alligator clip on the back that can easily be attached to any pocket, collar or bag. The badge holder will not fall off or damage your clothes, so you can wear it any time. PREMIUM MATERIALS: Our nursing name badge holder is made with high-end felt material, very resistant plastic and metal that will make the ID holder last for a long time. 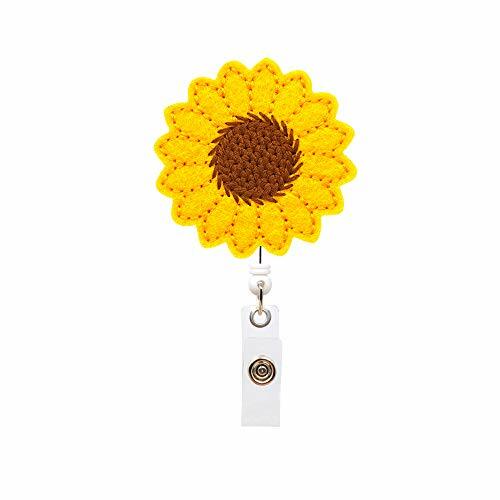 This way, you can make anyone's day better with a simple cheerful badge reel holder. SUPER CUTE: If you are a nurse, student or teacher, then you know how important it is to make a good first impression. 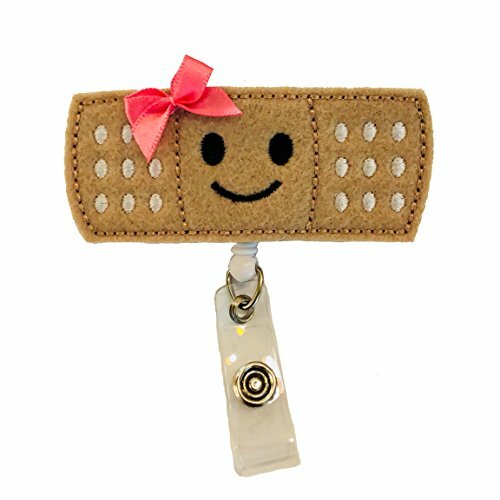 The felt badge reel is very cheerful, having a bandaid shape with a smiley face and a super cute pink bow that will make anyone smile. RETRACTABLE DESIGN: One of the best parts about our premium felt ID reel holder is that it's retractable, making it easier for you to use your ID without having to take it off all the time. You can save time and cheer up your patients at the same time! 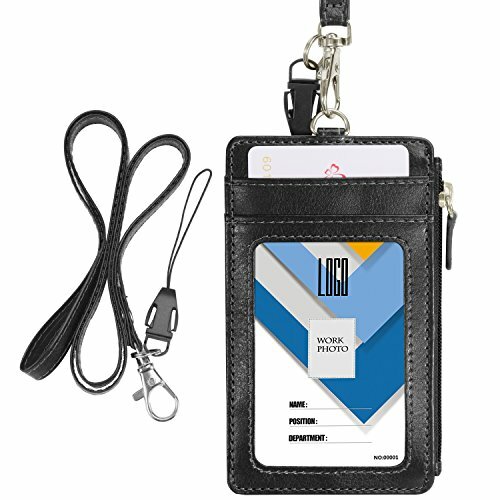 Wisdompro 2-Sided Vertical Style PU Leather ID Badge Holder with zipper pocket, specially designed with 1 ID Window and 1 Card Slot in front, 3 card slots in back and a zipper pocket, perfect for your ID card, Credit card, name card, cash and other small stuff. It also comes with 1 piece 20 inch PU leather neck lanyard / strap. Dimensions: Outer Dimension About: 4.77"x2.2.93"x0.35" (121x75x9mm) Front ID Pocket Size: 2.54"x3.6" (65x92mm) Other Card Pocket Size: 2.54"x3" (65x76mm) Wisdompro Retail Package includes: 1 x PU Leather ID Holder (Paper ID card excluded) 1 x 20" PU Leather Neck Lanyard Wisdompro Customer Satisfaction Warranty: If you encounter issues with any Wisdompro product, please do not hesitate to contact us, we will be happy to help you solve it. Wisdompro products are sold by authorized sellers only. NAGUCI Badge reel design clips securely to keep badge readily available. 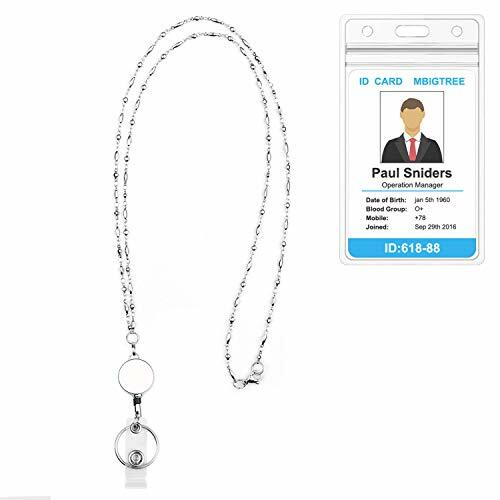 The strap connects easily to any ID card or name badge with clear badge holder. we would be delighted to help you and reply as soon as we can. 60 days money-back & 12-month warranty. Any questions please don't hesitate to contact us. If you like our product, click Add to Cart to get it. 1. Due to differences in light and screen, the color of the item may differ from the picture. 2. Due to manual measurement, please allow have 0.5-2cm differences. RETRACTABLE LENGTH: Badge Holder cord max 24 retractable length, with the durable nylon wire and automatic stretching could meet the most daily use. The YOROYAL Original Retractable Badge Reel is made of high quality material with professional production line. 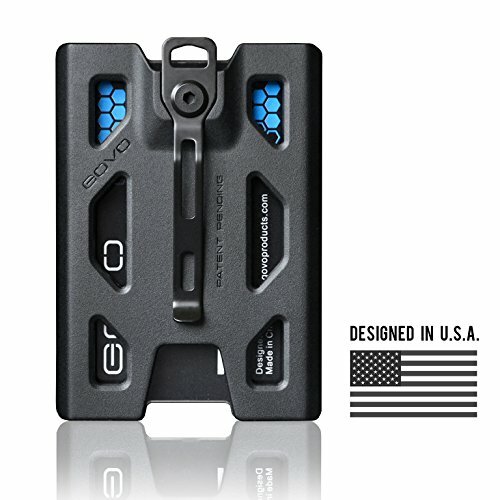 With 3 ounces of retraction force, the reel will hold anything equal in weight to 5 ID cards. The alligator clip slides easily over most pockets and collars. Also fits on your pants pocket, very convenient to use. - A great decoration for your uniform, full of fun! - Perfect for carrying your Keys, ID Badge Holder, Credit Cards and Working Badges. 30 days money-back & 12-month warranty & Permanent customer service for you. If you have any problem of our product, you can click "seller contact" button in your Amazon account to contact us. we would be delighted to help you and reply in 12hrs. Max 24 inch Retractable length, lightweight, easy to retract. Item Diameter: 32mm / 1.26"
Item Thickness: 7mm / 0.25"
Top grade Acrylic material let it Very clear and durable. If you have any problem of our product, you can click "seller contact" button in your Amazon account to email us. we will help you and reply as soon possible. QUICK ACCESS - Clear acrylic Holder can be scan barcode. MULTIPURPOSE - Our name badge holders are especially useful for work, sporting environments, great for your key, name tags, travel luggage tags, ID card. Perfect for doctors, nurses, office staff, students, employees etc. HIGHLY TRANSPARENT MATERIAL - Durable acrylic (PMMA) material, Wear and corrosion resistance. The first ID badge holder on the market using acrylic.